You’ve done the hard part already. You’ve talked to a chemical tank expert at Poly Processing, designed your chemical tank system, double-checked that all the fittings you’ve ordered are compatible with your chemical, and you’re ready for your new storage tank system to be delivered. Now that your order is placed and you’re preparing to receive your polyethylene chemical storage tank, there are some steps you need to have in place before your tank arrives. But what should you expect when your polyethylene tank arrives? If you manufacture, sell or distribute water treatment or distribution products in North America, your products typically must comply with NSF/ANSI Standard 61. NSF/ANSI 61 sets the criteria for water system components to protect health standards. It’s important that all components in water treatment meet the correct standards to ensure dangerous toxins aren’t leached. However, there is confusion about NSF-61 certifications, and that confusion could lead to purchasing the wrong product for your application. Let’s explore NSF/ANSI 61 and how to make sure your chemical storage tank system meets the necessary requirements. Our team wanted to test how polyetheylene tanks would hold up in the real world. So we subjected rotomolded, cross-linked and linear high-denisity poly tanks to high-impact and pressurization tests. Whether you're storing dangerous chemicals or condiments, reliability is one of the most important factors to consider when purchasing a tank. The last thing you want is to lose product/revue or an employee to get hurt because your tank can't stand up to potential environmental stressors. That's why we've built our cross-linked polyethylene (XLPE) storage tanks can handle almost anything. We had some fun putting them through the industry's toughest durability test and as you’ll see below, the the results are impressive. We’ve written several articles about the importance of protecting your chemical storage tank from aggressive chemicals. 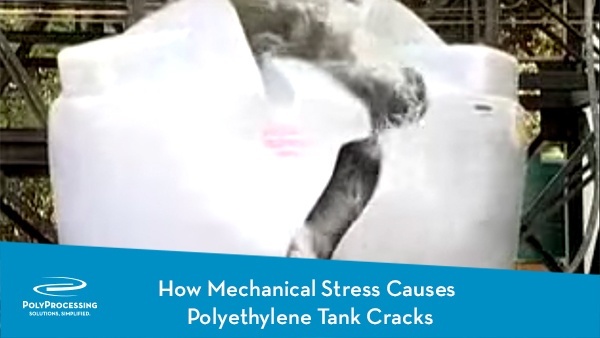 Mechanical stress can be just as significant, causing polyethylene chemical storage tanks to crack. Mechanical stress occurs when the tank’s structure is compromised after a physical impact with another object, over pressurization, or rigid plumbing that doesn’t allow natural expansion and contraction of the tank. There’s more to chemical storage tank colors than you might expect. When you purchase a Poly Processing tank from the catalog, you can select an unpainted translucent tank or a black tank. But many of our customers want to know if they can order a custom color for aesthetic reasons or branding purposes. If you need a custom color for your tank, you have a couple of options—some are better than others. A tank pad, or housekeeping pad, provides some elevation above the containment berm so that plumbing can be fitted to the bottom of a chemical storage tank. Housekeeping pads are popular with our customers, but you need to be sure you plan correctly to get the best use out of them.